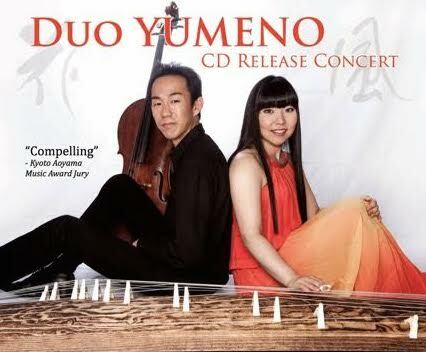 Sunday, October 18 from 1:00 p.m. until 2:30 p.m.
New York-based Duo YUMENO – Yoko Reikano Kimura (koto/Japanese 13-string zither, shamisen/Japanese long-neck lute, and voice) and Hikaru Tamaki (violoncello) – presents a concert of contemporary works as well as classical Western and Japanese music. The duo is celebrating the recent release of its first album, Flowers, Birds, Wind, Moon: The Music of Marty Regan, which features the first and only significant duo written for koto and violoncello. The internationally acclaimed composer Marty Regan was commissioned by the duo to write this suite over the course of four years, and the recording was completed in early 2015. The blending of these two instruments was praised as “exquisite” and “compelling” by the Aoyama Music Award jury in Kyoto, Japan, which awarded the duo the 2014 Baroque Saal Prize. The concert will also feature newly commissioned works by the renowned composer Daron Hagen and by Yoko Satō. Seating is limited, so please order tickets online at brownpapertickets.com or email info@duoyumeno.com with your name and the number of people in your party for guaranteed seating.